Network File System (NFS) is a network file system protocol allowing a user on a client computer to access files over a network in a manner similar to how local storage is accessed. NFS, like many other protocols, builds on the Open Network Computing Remote Procedure Call (ONC RPC) system. 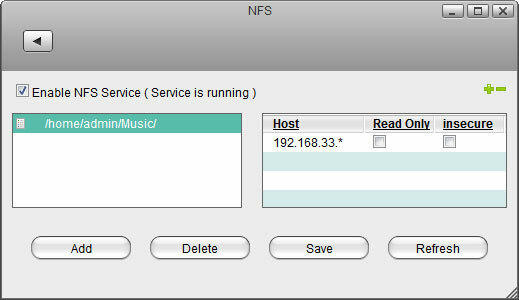 Enable NFS Service Select the check-box to enable the NFS service. The current state of the service is displayed as “Service is stopped” or “Service is running”. Click the Plus icon to add a new host. Click the Minus icon to delete a host. Host The IP address or IP range of the client. Read Only This client has read access but cannot modify or add any data. Insecure Enable this option when mounting the drive on Mac OS X. Add Click Add, select a new directory and then click Open to add the select directory. Delete Click Delete to delete the selected directory. Save Click Save to save the changes. Refresh Click Refresh to refresh the page.